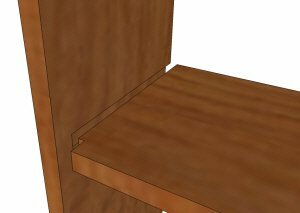 One of the most widely used woodworking joints is the dado joint. It is commonly found in the construction of bookcases, cabinetry and many other types of furniture where large panels are used. Sooner or later most woodworkers will run into a situation where they'll need to use this joint, so getting the mastery over it early on is a good idea. It's not hard to make, but like any other woodworking joint, it needs to be cut accurately for a good fit. 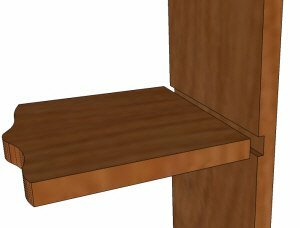 This common style of dado joint is called a through dado. The groove extends across the entire width of the board. The depth of the dado groove should be no more than half the thickness of the stock, with about one third being the norm. Too deep and you could severely weaken the material. The through dado can be cut with the table saw, on a router table, or with a hand held router and a shop made jig. The finished appearance of this joint will depend greatly on the fit and finish of the dado and the squareness on the end of the board it will receive. The dado groove must have clean cut square shoulders and the bottom must be flat. Any tearout and splintering of the material around the groove will not be covered up when the joint is assembled. The stopped dado is used for those times when you don't want to see the joint connection at the front of the finished project. The stopped dado is used when a cleaner appearance is wanted on the front of a cabinet or bookshelf. Instead of cutting the dado groove right through to the end of the material, it is stopped short, usually by about the same distance as the thickness of the material. A notch is then cut off the end of the board that fits in the dado. This notch matches the length of the material left in front of the dado. Again, the dado groove can be cut with the table saw or router. If using a table saw though, the blade radius will leave a fair amount of material that must be cleaned out with a chisel. With the router, only the corners of the dado will need to be cleaned up with the chisel. With the rabbet and dado, a dado is cut in one board narrower than the board it will receive. A rabbet is then cut in the second board leaving a tenon the same size as the dado in the first board. Stronger and more rigid than the basic dado, the rabbet and dado is often used in cabinetry and drawer construction. 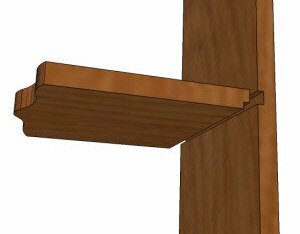 The dado width can be one half to three quarters the thickness of the board that will fit in it, depending somewhat on the load (in the case of a shelf) that it will be subjected to. This joint is more rigid than a standard dado because of the extra shoulder and gluing area that the rabbet provides. Tall bookcases and cabinets will benefit from the use of the rabbet and dado for shelves. As with the stopped dado, the rabbet and dado can be stopped short of the end if a cleaner appearance is desired. 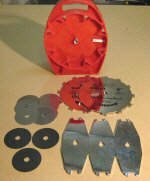 Freud Stacked dado saw blade review.